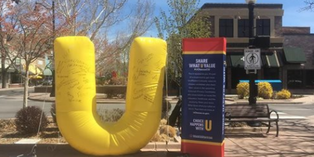 Boulder County, Colo. –The UChooseCO giant inflatable U, the Colorado Secretary of State’s UChooseCO campaign team, along with staff from the Boulder County Clerk & Recorder’s office will be registering voters and answering voter questions about unaffiliated voters participating in the Primary Election at two different City of Boulder locations on Wednesday, May 2. All are invited to stop by, say hi, and write on the U a word or phrase that expresses what they value most about participating in democracy. When: Wednesday, May 2, 11 a.m. – 1 p.m. When: Wednesday, May 2, 3 p.m. – 4:30 p.m. The Boulder County Clerk & Recorder’s Election Division, in conjunction with the Colorado Secretary of State, has an ongoing voter education campaign that aims to inform unaffiliated voters about their ability to vote in the upcoming June Primary and the options they have in selecting and casting their ballot. Learn more by stopping by one of the events or by visiting www.BoulderCountyVotes.org or www.UChoose.CO.Gov.